Take A 360-Degree Trip In Crumb's Psychedelic 'Locket' Video Plastic hearts cooked in a skillet, a lizard chopped with chives, a world absorbed into a marble. It's all part of a pleasant trip in the psych-pop band's new video. Crumb's video for "Locket" is art in motion. Not every acid trip will scar you with weird, drug-laced nightmares. In fact, if you play your cards right, a short experience could turn into a bout of revelatory visuals that inspire your creative side or a string of warped non sequiturs that become enjoyable in their randomness. In Crumb's new music video for "Locket" — a song originally released on its 2017 debut EP of the same name — members of the psych-pop group find themselves enjoying both of those sides in a memorable, 360-degree trip. Directed and edited by Haoyan of America, the video sees the Brooklyn-via-Boston four piece holed up in a makeshift party house while experiencing the best, weirdest side effects imaginable. The video primarily follows front woman Lila Ramani as she wanders through the house, tripping from drinking tea. Fog overflows from her cup like it's poured straight from a swamp. Soon, Ramani starts seeing things — plastic hearts cooked in a skillet, a lizard chopped with chives, the world absorbed into a marble — as her bandmates and friends goof off around her. But they begin to see it, too. The music video toys with the malleable groundwork Crumb lays out in the song. "Locket" is a musical version of what we see on screen. The guitar's psychedelic tones and the wavering keys present a dreamy, jazzy world that the video resides in. While the bass plucks its way through the tone of '60s pop, drummer Jonathan Gilad plays loosely to make room for improvisational keys and playful pedals. Above it all is Ramani, singing about disassociation and silent secrets. "My body so restless / It lives in the basement below some boxes / Makes me feel so strange and so thoughtless," she sings. 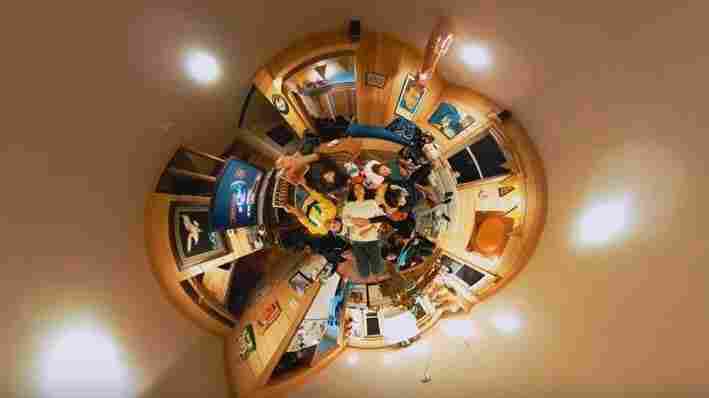 As entertaining as the unpredictable details of this drugged-up event are, the most memorable moments come from the director's use of a 360-degree camera. Ramani walks carefully through the house while holding the camera, looking unfazed, as the whole room curls around her. It gives her visions a communally mind-bending feel to what would otherwise be a personal experience. When spinning text and intersecting visuals splice into the frame, things get even weirder. It's art in motion. By the time the viewer adjusts to it, so do the video's characters. The visual ends with a slow zoom on a perplexed man who sits on the couch, mug of steaming tea in hand, brow furrowed while he stares off. Behind him, text on a poster shifts from side to side. His facial expression eventually changes to one of pleasant amusement as he finally accepts things for what they are — even if they don't make sense. Crumb and Locket are out now.